This was the second learning theme of our year. I selected it, unlike the themes that will follow. 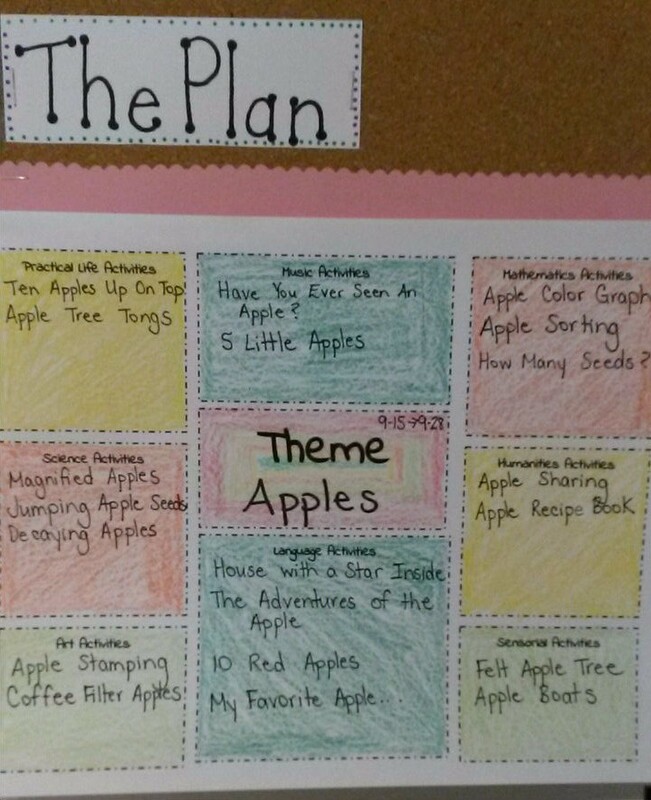 This theme started on the third week of school, so I started planning during week one. At that point, we were all still learning about each other and settling into routines, so I didn’t feel like the kiddos were ready to vote on a theme quite yet. Even though it was my choice, the kids still enjoyed all the fun activities. You can find out more about our classroom, my planning process, and get a link to my template here! 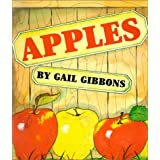 After reading Ten Apples Up on Top by Dr. Seuss, I introduced this game to the students. I made number cards with index cards. I chose to write the number and provide a dot array. I noticed that several of my students can count accurately (sometimes with guidance), but are not currently recognizing numerals. I picked up some foam cubes at the Dollar Tree (love, love, love the Dollar Tree) and drew some apples on the red and green ones. 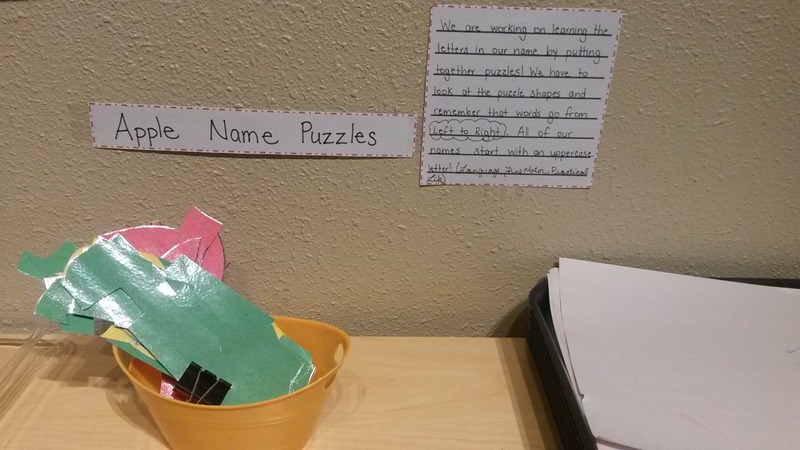 I put the number cards in one bowl and the cubes in another. 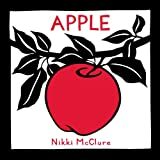 The student picked a card and then stacked that number of “apples”. 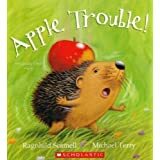 While reading the book, we talked about whether or not we could stack real apples and the students quickly realized that it wouldn’t be easy because apples are round like balls and would roll away. 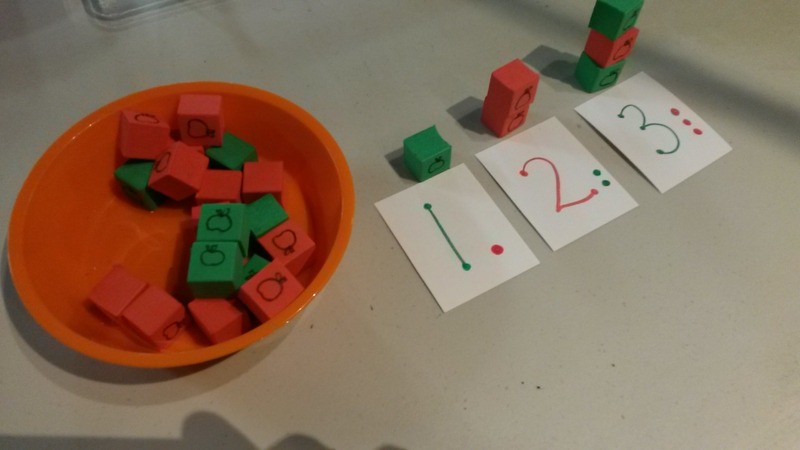 This activity connected wonderfully with the book and supported one-to-one correspondence, number recognition, fine motor skills, motor planning, critical thinking, and (without prompting) patterning. I used numbers 1-5 for my MWF class and numbers 1-10 for my T/Th class. All of my students can recognize their names and can identify the initial letter. A few of them can write their names without a model. But none of them were proficient at putting the letters of their name in order in any other context. This was an easy activity to make using construction paper. I wrote their names, drew a few lines, laminated, and cut the pieces apart. For my MWF class, I kept each name separate. My T/Th class asked for more of a challenge (“You can’t trick us!”), so I mixed all of their name puzzles together. At the end of the unit, I sent each child’s name puzzle home for extra practice. This activity is almost entirely from the Dollar Tree. I got one package of pompoms, one package of tongs, and a three-section tray. I pulled out the red, green, and yellow pompoms and put a corresponding apple on the bottom of each section of the tray. 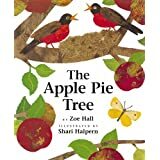 This activity, for being so simple, was a class favorite and was pulled off the shelf at least once a day. 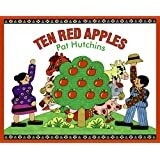 It supported color matching, sorting, and fine motor skills. We also got to work on taking turns, sharing, and taking care of our classroom environment. This was a fun idea, but a little anti-climatic for the students. We ended up putting in more baking soda and vinegar and had fun making minor eruptions. During the discussion about the experiment with my T/Th class, they started making hypotheses about other seeds. 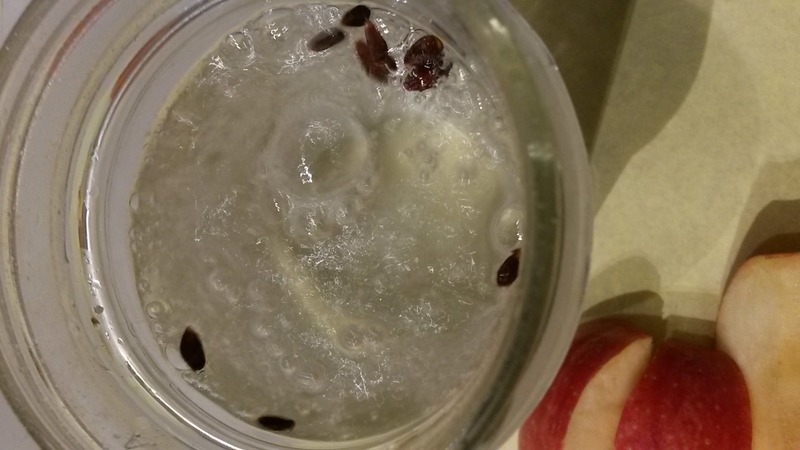 They wondered if an avocado seed would even float (since it’s much bigger and heavier than apple seeds). So, in the interest of student-directed learning, we tested that out a few days later. 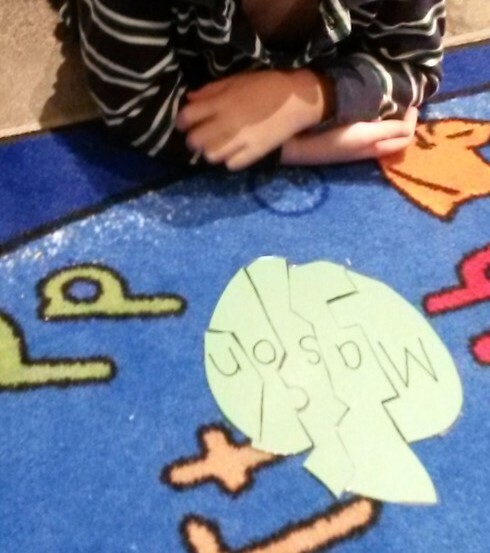 The avocado seed did float, but didn’t jump…so then they asked if it would grow! Now it’s hanging out on our counter. There was a good bit of science, a bit of fine motor, and tons of oral language development with this activity even though it didn’t go exactly to plan. I should add that we started this experiment by counting the number of seeds in each of our apples. 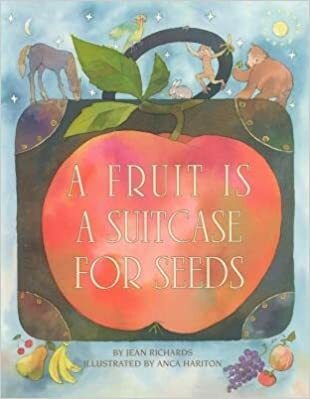 Just by chance, we had one apple with 1 seed, an apple with 2 seeds, an apple with 3 seeds, one with 4 seeds, and one with 5! The kids enjoyed this art activity. 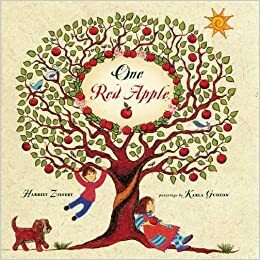 We talked about apple colors and what shapes we could see (circles with stars in the middle or hearts depending on the apple and how it was cut). This activity was messy. Just a heads up. The markers in my classroom say “washable”, but my hands were definitely orange until I got home and used the heavy-duty soap. The amount of water needed to make the colors run also meant the filters dripped orange-dyed water. Now that that disclaimer is out of the way… This was a two-step project. One the first day, we colored the coffee filters with red and yellow markers. Then we sprayed the filters with water (over the sink) until the colors started to run together. 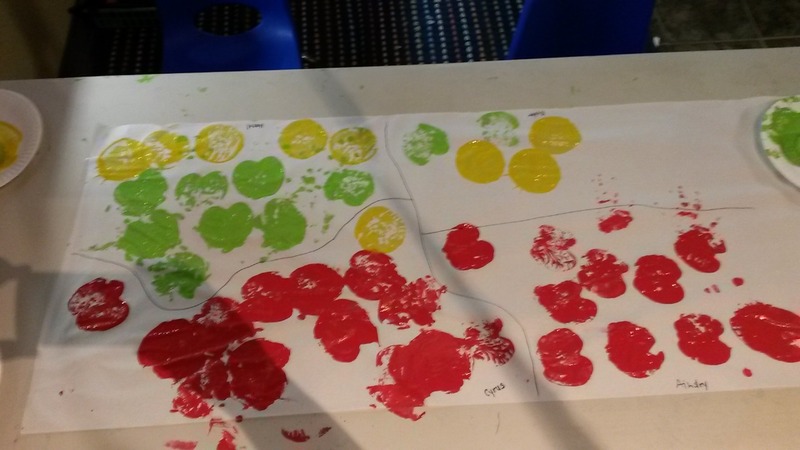 The students were so excited to see their red and yellow marks blend together to make orange. We then let the filters dry completely. On the second day, we glued the filters into the apple frames and cut around the edges. 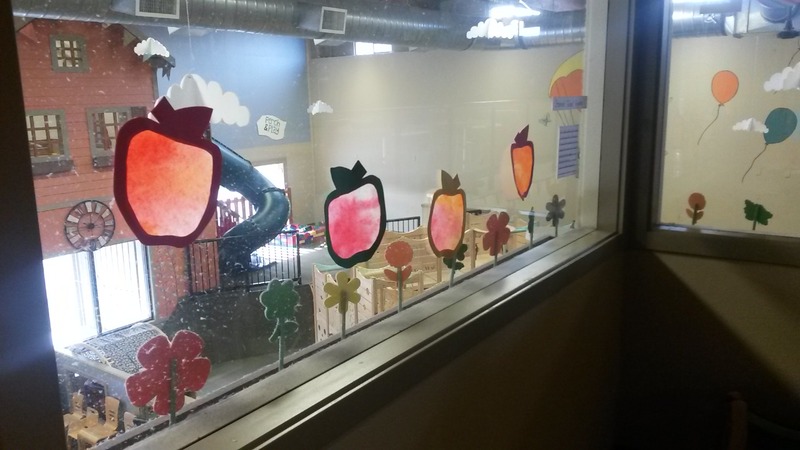 These were a beautiful window display and the parents loved taking them home to hang up at home. 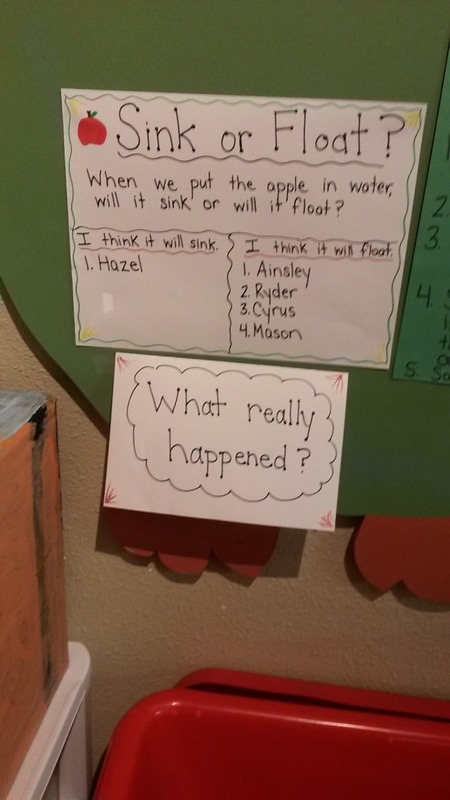 We started out by predicting whether or not the apples would float. What really happened? They floated! 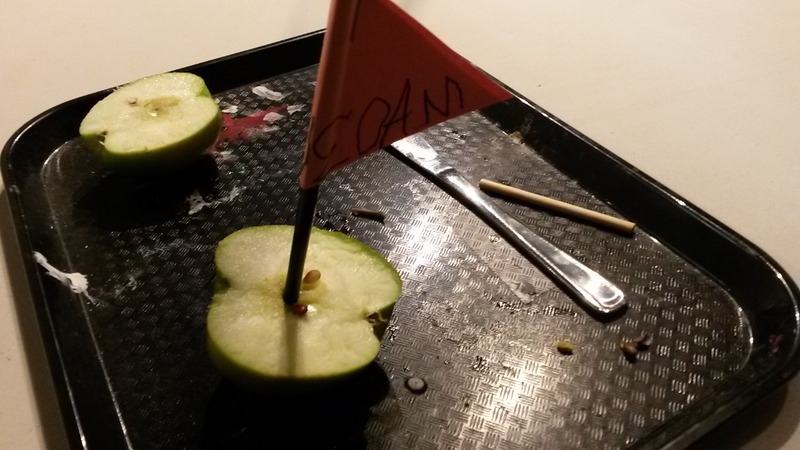 Then, we cut the apples in half and made a sail from half of a straw and paper. I used a small dowel I had in a drawer to make a hole for the straws so it was easier for the students to put their boats together. The students then sailed their boats in our water table and proved (yet again) why “Just In Case Clothes” are necessary. We learned that paper degrades in water and that wet paper is heavier than dry paper. After a few boats capsized, they wouldn’t remain upright because their sails were too heavy. By the end, they had all removed the sails. Next time, I’m planning to use thin craft foam for our sails. Once the sails had been removed, the straws became the object of experimentation, too. A few students tried blowing into their straw and made their apples bubble. 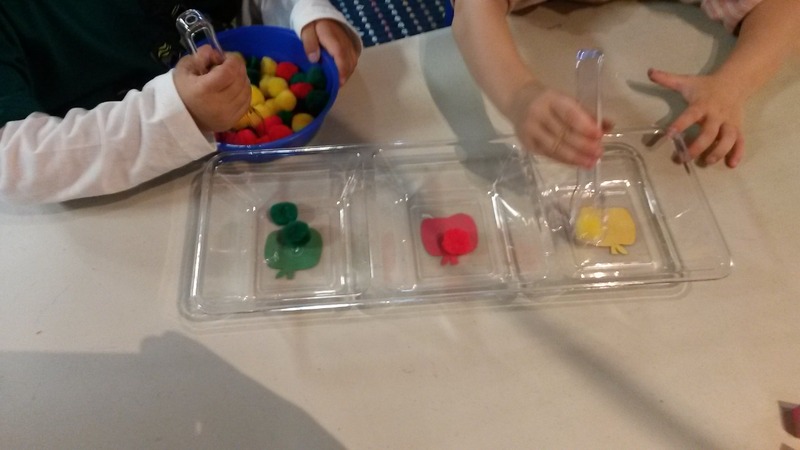 Others used the straws to make their apples spin like tops in the water. This was another activity that didn’t go exactly according to plan, but it was still a valuable opportunity for science, sensory play, and oral language development! I stopped at the store and got one of each type of apple. 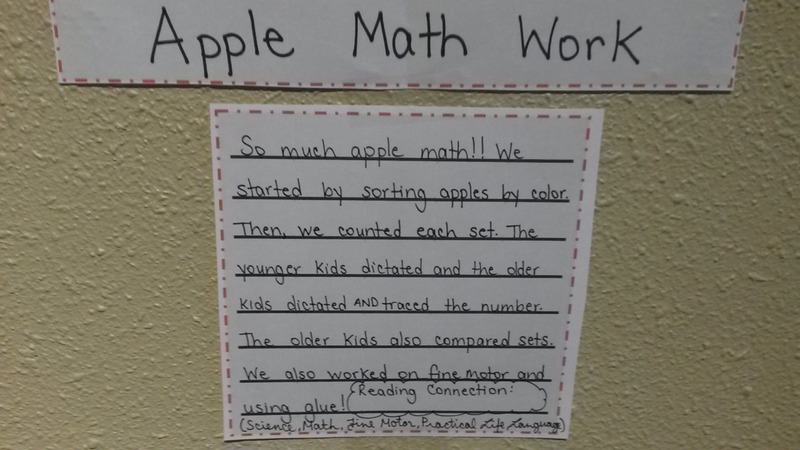 We compared the way the apples looked and which ones we’d tried before. Then we cut them up and tasted each one. 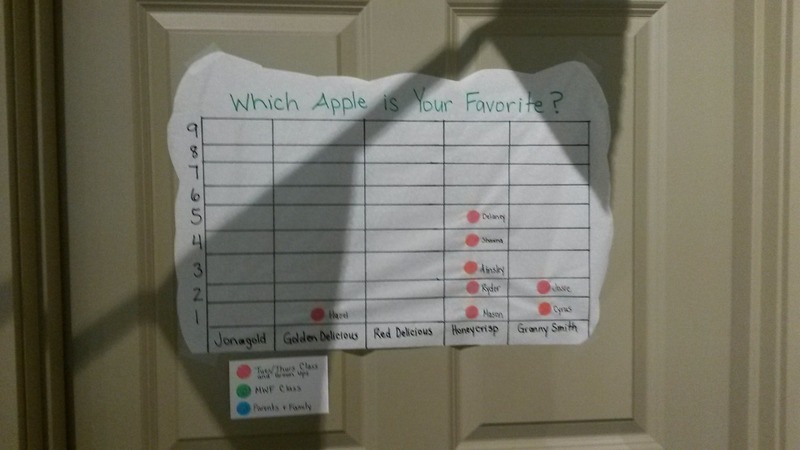 We finished the activity by making a graph–as you can see, Honey-crisps were the winner of the T/Th class. Once the MWF class finished the activity and we polled family members, the Honey-crisp column had to be extended. 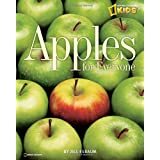 *After introducing these activities at Circle Time, they are put out on the shelf for students to use during Exploration Stations. I also pull them back out at the end of the day when we’re waiting for families since they’re easy to clean up. 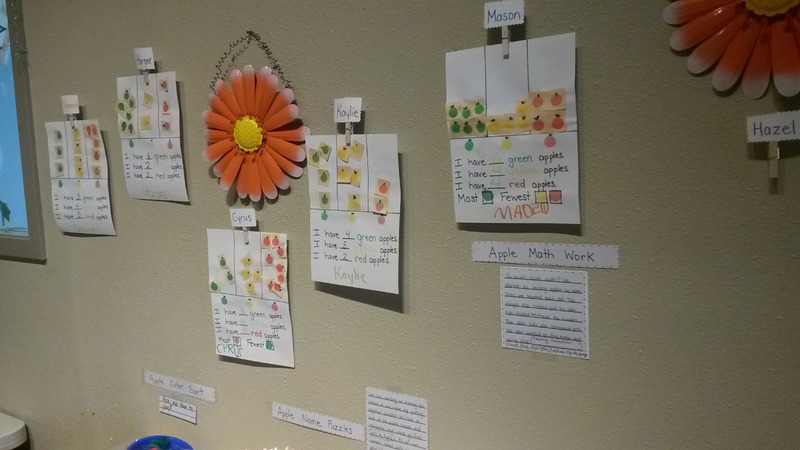 Using them at the end of the day also gives parents the opportunity to see what the kiddos have been doing and the students are always excited to show their family members what they’ve been working on.